When you are working with multiple open windows in Windows 7, you might have a tough time finding exactly what you want. Shuffling between the different windows can be really irksome and you might end up losing valuable time in the process. The Aero feature in Windows 7 enables you to effectively manage all your open windows effectively. The Aero Snaps feature in Windows 7 allows you to maximize, minimize, and stack windows side-by-side. You can do these using the mouse or using keyboard shortcuts. To maximize the active window, click the title bar and drag the window to the top of the screen. When the window touches the top edge of the screen, the window will maximize. You can maximize the active window vertically by dragging the top or bottom edge of the window to the top or bottom edge of the screen. To snap the active window to the left of the screen, drag it to the left. When the window touches the left edge of the screen, it will occupy about 50% of the left side of the screen. To snap the active window to the right of the screen, drag it to the right. When the window touches the right edge of the screen, it will occupy about 50% of the right side of the screen. You can restore a maximized window by clicking and dragging it from the edge of the screen to the middle of the screen. The window will then return to its previous size and position. You can also minimize all open windows except the current active window using the Aero Shake feature. Click the title bar of the active window that is in a restore state and vigorously shake the mouse to the left and right. To restore all the windows back to the original state, repeat the shake action. When you have a whole bunch of open windows and you need to check for something that’s on the desktop, it will be annoying if you have to minimize each and every open window. The Aero Peek feature in Windows 7 allows you to peek into your desktop without disturbing any of the open windows. You can do this by hovering the mouse pointer over the rectangular button at the right corner of the task bar. All the open windows are briefly hidden, although you will see the window outlines. If you want to view the desktop, click this button. All open windows are automatically minimized. When you hover the mouse pointer over a taskbar icon, any open and minimized program window will be displayed as a thumbnail. If you hover the mouse pointer over the thumbnail the window is displayed in the background in full screen view. The Alt+Tab action in previous Windows versions is now enhanced and renamed as Windows Flip to include thumbnail images of multiple windows. When you press Tab while holding down the Alt key a palette is displayed with icons of all running programs, Continue to press Tab again with the Alt key down to move to the next icon in the palette. When you when you release the keys, the highlighted program window is displayed on the screen. You can also use the Ctrl+Alt+Tab function to display the palette without having to continually press the keys. You can now navigate to the desired window using the arrow keys. 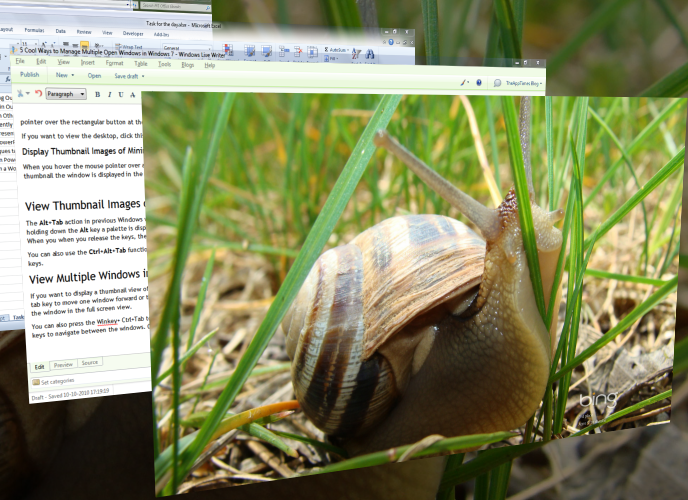 If you want to display a thumbnail view of all open windows in a 3D-stacked view, use Windows Flip 3D. Press Winkey+Tab to view the 3D stacked view. Continue to press the Tab key to move one window forward or the Winkey+Shift+Tab to move one window backward. Once you reach the window that you want to view, release the keys to view in the window in the full screen view. You can also press the Winkey+ Ctrl+Tab to view the windows in 3D stacked view without continually holding down the keys. You can use the arrow keys to navigate between the windows. Once you reach the window that you want to view, press Esc to view in the window in the full screen view. Now that you know these easy-to-use desktop effects, use them when working with multiple open windows. Windows 6 is the coolest. Just by reading your blog posts I’ve learned so much. Thanks.